Ucluelet’s history as a fishing village is much older than the town itself. It started with the Nuu-chah-nulth, whose presence on the shores of Ucluelet has been traced back to over four thousand years ago. They were uninterrupted in their way of life, which included fishing for salmon, halibut, cod and shellfish, until the Europeans arrived in the late 1700s. Rather than catching salmon, their main goal were furs, whales and seals. Later, as more and more people flocked to the coast for a number of different reasons: the paved road, the endless beaches, surfing, hiking, camping… It was discovered that there was gold (literally) on the shores of Florencia Bay, as well as plenty of fish to be had. By 1914, the fishing industry in Ucluelet was getting into full swing. Once the road from Port Alberni to the coast was finally completed and paved, fishing charters began to spring up all over the west coast of Vancouver Island. Halibut fishing, salmon fishing, rock cod and lingcod… Everyone wanted a taste of the abundance of Ucluelet’s waters. Today, Ucluelet is a top fishing destination, and the activity is easily one of the top things to do. There are countless charters to choose from, all offering a different aspect of fishing. By now, Ucluelet’s guides have the sport in their blood, and a number of them have had the trade passed down through generations of fishermen and guides. In fact, reviews are stating that Ucluelet is even better for salmon than Alaska! Booking a fishing vacation is now a top priority, and a number of charters cater to guests wanting to book packages that include everything from accommodation, to vacuum packing of their catch. From as early as March to late September, anglers are out to catch their fill of Chinook and Halibut. Mid-summer sees the Coho run and the lingcod, rock cod and other bottom fish are around all year long. As summer goes on, larger chinook, also known as Tyees, begin landing on boats and they’re the real prize of the season. 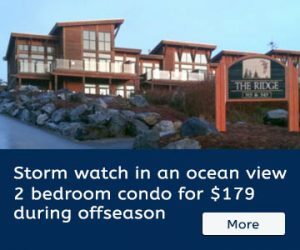 Aside from incredible salmon fishing, Ucluelet has convenient and luxurious accommodation just moments way from the marina, rather than your typical lodge. That, plus you can enjoy the amenities of a tourist-friendly, laid-back fishing town and a world-class destination for kayaking, surfing and hiking during your down-town. You’re not just trapped in some remote location! If you’re looking to enjoy a true, West Coast adventure, or want to experience a historical piece of life on the coast, fishing in Ucluelet might just be the activity for you. While downriggers, lures and other specialty equipment have changed the art of fishing over the years, there is still a long-lasting legacy of life on the ocean, respect for its creatures and enjoying the abundance of what it has to offer us on the west coast of Vancouver Island. To find some great accommodation and just book a charter for an afternoon, check out our accommodation page, or www.vancouverislandvr.com. A recommended charter that books packages, or day trips, check out www.salmoneye.net.